Training Industry Inc. announces the 2015 Top 20 list, in which SweetRush is recognized for the quality of its clients and portfolio, as well as its industry visibility, innovation, and impact. SAN FRANCISCO, Ca., May 21, 2015 – SweetRush Inc., a performance improvement company creating effective and engaging learning solutions that make a positive impact on businesses and their employees, has been added to the prestigious Top 20 Content Development Companies List on TrainingIndustry.com. 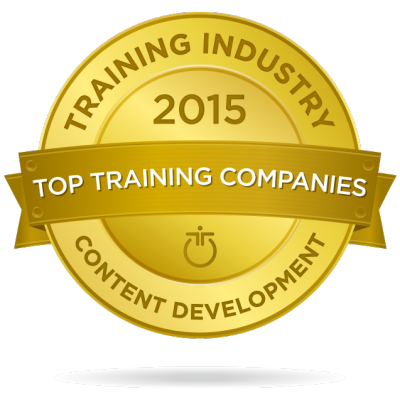 View the 2015 Top 20 Content Development Companies. “This year’s Top 20 Content Development companies are finding unique and effective ways to design learning programs to support employee, partner, and customer development across all industries,” said Doug Harward, chief executive officer, Training Industry, Inc.
“We are deeply honored to have been selected by TrainingIndustry.com, and to be associated with such an outstanding group of industry leaders,” said Arturo Schwartzberg, chairman and co-founder, SweetRush Inc.
TrainingIndustry.com announced its Top 20 Content Development Companies List as part of its mission to continually monitor the training marketplace for the best providers of training services and technologies. At SweetRush we help organizations improve employee performance by teaching knowledge and skills and, ultimately, changing behavior. Through analysis, we get to the heart of the business drivers and what is important to learners, and then design learning solutions and communications that meet our clients’ objectives. Our learning solutions are typically blended, and we excel at the intersection of instructional, visual, and technical creativity, which results in effective and interactive training, and a high ROI for our clients. Our work leverages our expertise in gamification, simulations, and mobile applications. SweetRush is about 100 people strong, has been in business since 2001, and, similar to most companies in the industry, is comprised of instructional designers (of various flavors), multimedia designers, engineers, project and program managers, and solution architects. However, beyond the similarities, we like to promote that we are different, as we say, in a good way. We do not have salespeople, and the moment you touch us, you will be in the hands of one of our solution architects, a consultative expert. We have a truly remarkable and committed team and a unique culture that is validated by our near-zero turnover. Our culture is based on caring: caring about each other, our clients, and the planet. For more information about our company please visit www.sweetrush.com. We’d be honored to work together, so please reach out.